This page provides a quick introduction to the campaign of the Coalition for Justice in Hawaiian Gardens and Jerusalem. You can find dozens of news reports and documents by clicking on the links above, which are available throughout the site. Irving Moskowitz exports misery from Hawaiian Gardens to Jerusalem along with the money he collects from gamblers at his bingo and casino in Hawaiian Gardens, a small predominantly Latino city in Los Angeles County. Gambling on Extremism, How Irving Moskowitz took over a small town to bankroll Israel's anti-peace settlers (900kb PDF, right-click to save), a comprehensive report published December 16, 2003, on the devastating impact Moskowitz's California gambling operations have had on Hawaiian Gardens and Jerusalem, including new information on Moskowitz's ties to US "neocons." What we have tried to do with this report is to create a comprehensive analysis of Moskowitz's own "road map" of obstructionism. 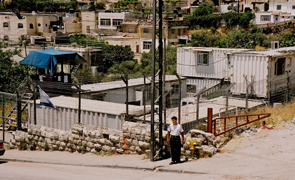 Our goal was to understand: What was his strategy in East Jerusalem? How does he use his California gambling operations to further his goals? Why has the Hawaiian Gardens city government been unable to reign in his card club ambitions or at least harness them to the betterment - rather than the degradation - of their own civic community? And just where did the money come from that first enabled Moskowitz to seize the role of principal financier of Israel's extremists? 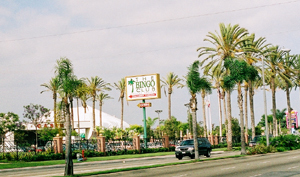 “This tiny, impoverished and predominantly Latino city in southern Los Angeles County is an unlikely locale for a high-stakes political squabble with international ramifications – but California seems to produce many strange imbroglios.” This article examines the controversial casino operated by Moskowitz in Hawaiian Gardens and what it means in terms of Middle East peace negotiations. It mentions the pressure Jewish and Latino activists are putting on California Attorney General Bill Lockyer to deny Moskowitz's application for a casino license. A Coalition-backed bingo reform bill would have eliminated some of the abuses of the bingo industry in California. Moskowitz's bingo club is a perfect example of a monopolistic establishment that prevents other charitable bingo clubs from surviving. Coalition coordinator Haim Dov Beliak explains how Moskowitz uses the Hawaiian Gardens bingo to thwart Israeli-Palestinian peace in this public television magazine show. The Coalition sent this letter along with a copy of a video documentary about the negative impact of Moskowitz’s gambling operations on Hawaiian Gardens and Jerusalem to Rabbis in the Western United States. The letter explains what Moskowitz has been doing in Hawaiian Gardens and Jerusalem and urges them to contact California Attorney General Bill Lockyer to request that he deny Moskowitz his casino license and revoke his bingo license as well. "...we believe it's important for you to know what Irving Moskowitz is doing, both in Jerusalem and the small city in Los Angeles County, Hawaiian Gardens. It's important because he's doing it in your name! Moskowitz has access to influential politicians and acts as though he has the support of the entire Jewish community." Then Coalition co-chairperson Mina Meyer hands President Clinton a letter urging him to tell California officials how Moskowitz has undermined US peace efforts and should not be granted a permanent license for his Hawaiian Gardens Casino. 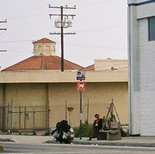 The Coalition for Justice appealed to then Israeli Prime Minister, Ehud Barak, to ask California’s governor and attorney general to stop Moskowitz's gambling operations in Hawaiian Gardens, which are harming that city and funding the activities of Israeli extremists opposed to peace with the Palestinians. The Coalition wrote to Barak because he was visiting the United States at the time. Coalition asks officials to review Moskowitz hate web site as evidence of unsuitability for a gambling license. The Coalition submits a legal brief demonstrating that Moskowitz does not have the character attributes California law requires of gambling licensees. The brief, submitted to California Attorney General Bill Lockyer contained compelling arguments for why, when it comes to licensing casino operators, character counts – and Irving Moskowitz, who has applied for a license to operate his Hawaiian Gardens Casino, doesn't have it.